Jussie Smollett has been officially sued by the city of Chicago. A lawsuit obtained by The Advocate claims that the actor submitted a false police report related to an alleged hate-crime incident in January and now owes the city damages for investigating the incident. Officials are asking for over $130,000 in damages due to the cost of investigating the claims. "During the course of CPD’s investigation into Defendant’s false statements, CPD has incurred 1,836 overtime hours, " the complaint states, "which resulted in the City paying $130,106.15 in overtime pay as result of Defendant’s false statements." 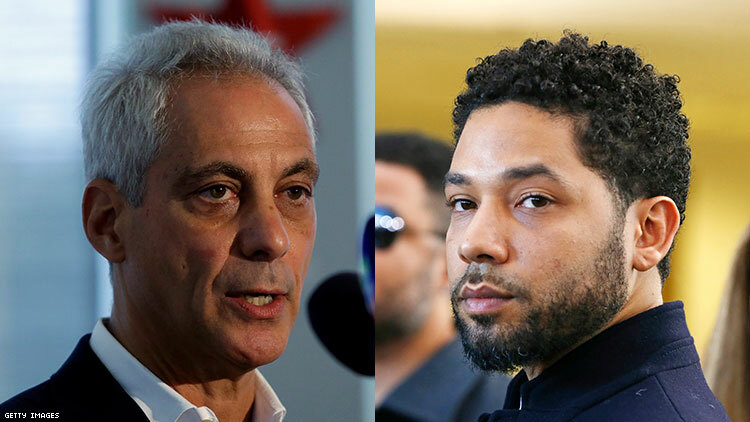 The lawsuit comes only 16 days after prosecutors in the Cook County state’s department dropped all felony charges related to case after Smollett agreed to forfeit his bond and complete community service. And Smollett still maintains that he was a victim of a bias-motivated attack. Chicago's current mayor, Rahm Emanuel, has made numerous public statements alongside the city's police superintendent where they have threatened that they would go this route because they say he lied to police and is not being held accountable. Police have responded in their own ways to charges being dropped in a case they passionately defended, and are largely supportive of city official's lasering in on the actor even as his case is no longer being tried by prosecutors. A few weeks ago, a protest was organized the union representing local police at the Cook County prosecutor's office that dropped all 16 felony charges against Smollett last month. They called for a form of 'accountability' to be delivered against the actor, and openly supported this lawsuit. Smollett’s representatives declined to comment on this lawsuit.